May pole dancing, London Buses ,Drinks reception and a pretty Suffolk village! Lottie and I have had a very busy week in May with lots of weddings! Lisa and David were married last week in Isleham in East Cambridgeshire. They asked me to serve my delicious ice cream at their wedding after the wedding breakfast. Guests could then relax in an area filled with games such as tug of war, coconut shy, space hoppers and croquet. A maypole was also provided for the guests to dance and have fun taking photographs. A hog roast was then set up ready for when the evening guests arrived. 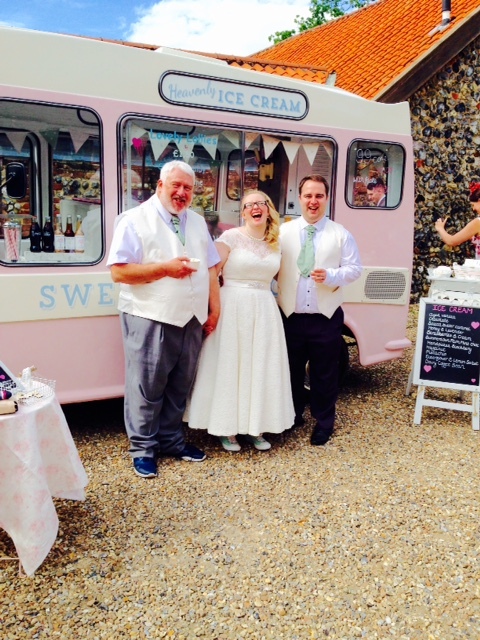 Jodie and Alessandro choose to treat their guests to ice cream after the church ceremony in the very pretty village of Marholm near Peterborough. As guests came outside from the church they were given a lovely surprise of ice cream and charm whilst photographs were taken. 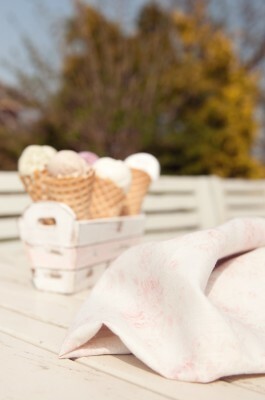 The groom and his family were Italian and all commented on how much they enjoyed the ice cream…phew! After the photos were finished, all the guests were driven to the reception on a red London bus which looked amazing. Emma and Tony were married last week at the beautiful Chippenham Park on the Cambridgeshire/Suffolk boarder. 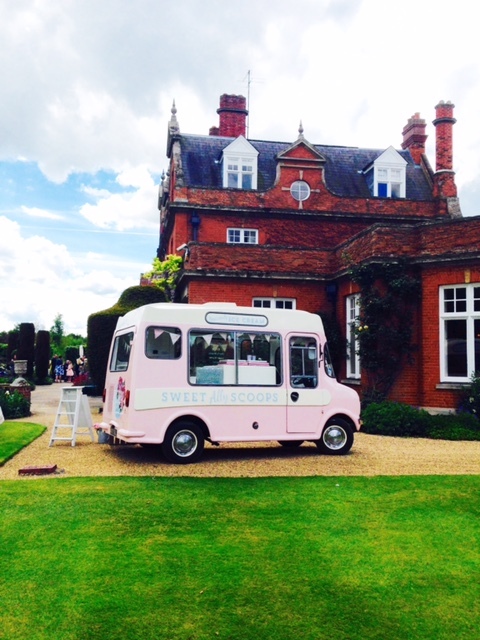 Emma treated her guests to ice cream alongside bucks fizz at the drinks reception. The sun shone as guests relaxed on the sun terrace at the picturesque wedding venue. Finally Katie and Matt asked me to serve at their wedding in Bardwell Suffolk. Guests were treated to a BBQ before the wedding speeches. Katie had kept my visit a surprise and it was so lovely to see everyone’s happy faces when I arrived at the venue playing Lottie’s wedding chimes! The ice cream was a huge hit after the BBQ food and I had the pleasure of chatting to Katie’s father about Bedford Ice Cream Van’s as he was ice cream vendor years ago! 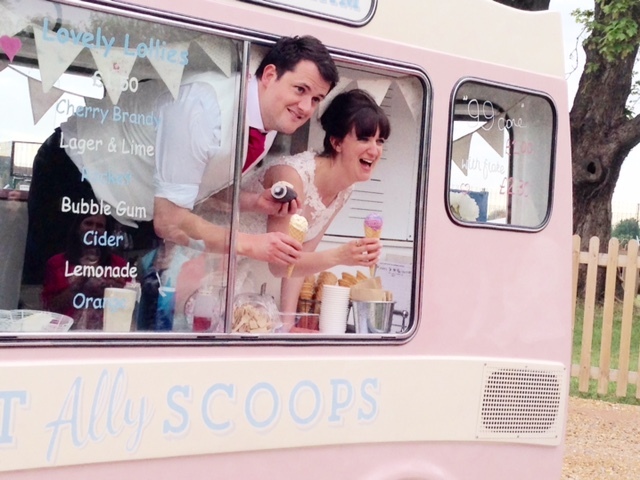 Four amazing weddings with lots of servings of ice cream!